The Trade Unionist and Socialist Coalition (TUSC) national steering committee, meeting this week for the first time since the election, has hailed the phenomenal support achieved for Jeremy Corbyn's anti-austerity policies in the June 8th poll. That support, together with the increase he is receiving post-election, can propel him to victory in the next general election and mean an end to government-led austerity. TUSC campaigns for another general election to be called as soon as possible. In the meantime, we believe that the level of support for Jeremy Corbyn's policies should be the signal for Labour-led councils to call an immediate halt to cuts to local public services. "The three-and-a-half million increase in Labour's vote achieved on June 8th is unprecedented since the 1945 general election and can only be seen as a ringing endorsement of Jeremy Corbyn's radical manifesto, with opposition to austerity at its heart. "TUSC is proud that, although we have been prepared to contest local elections against right-wing Labour councillors carrying out Tory cuts, we withdrew all our candidates for this general election in order to maximise the possibility of a Jeremy Corbyn-led government. "The election result makes it clear that the Tories do not have a mandate for continued attacks on public services, or even the capability to push them through if they met resistance. "Previously many right-wing Labour councillors have justified passing on Tory cuts to local council services on the grounds that the government would 'take over' the running of their council. This always exaggerated the powers the government had but now that position is even less credible. "If the 100 or so Labour-led councils declared that they will use their borrowing powers and reserves to stop all cuts - in the expectation that they would be reimbursed by a future Labour government which may be just months away - what could the Tories do? "Council services include vital adult social care spending, the cuts to which became a flashpoint issue in the election with the 'dementia tax' fiasco. "Councils also have the power to step in and underwrite school budgets so that the current school sackings of teachers and support staff, another headline election issue, could be stopped at once. "And then there is the issue posed by the Grenfell Towers tragedy, of councils taking all the immediate steps necessary to keep housing safe - regardless of the housing budget cuts the government says they should be implementing. "Let the 'weak and wobbly' Tory government dare to take on councils protecting these and other local public services! And if they tried they would only bring the next general election nearer and guarantee their final demise". TUSC, co-founded by the late Bob Crow in 2010, is a coalition involving the RMT transport workers' union, the Socialist Party and independent socialists. The 80,000-strong RMT, which is officially represented on the TUSC steering committee, welcomed the surge in support for Jeremy Corbyn as "a fantastic development that has rocked the political world to its foundations" (RMT press release, 9 June). "This election has sent out the clearest possible message that the British people have rejected the Tory programme of cuts, austerity, privatisation and division" and "there is no mandate for diluting safety on our transport services". Local councils with a say over the transport authorities in their areas, including those responsible for the Merseyrail and Northern Rail franchises, should immediately push to lift the threat to guards on their trains and face down any opposition they may incur from the Department of Transport. Hannah Sell, the Socialist Party representative on the TUSC steering committee, said: "TUSC was right not to stand candidates in the general election and to campaign for a Jeremy Corbyn-led government. But the Blairites have not gone away and are especially strong amongst Labour councillors. "We will campaign for the Tories to be forced out of government before the next set of local elections in May 2018, and for Labour councils to stop implementing cuts even if the Tories are clinging on. But in the event Labour councillors are still carrying out May's austerity policies, the Socialist Party believes that they should not expect to go unchallenged at the ballot box". 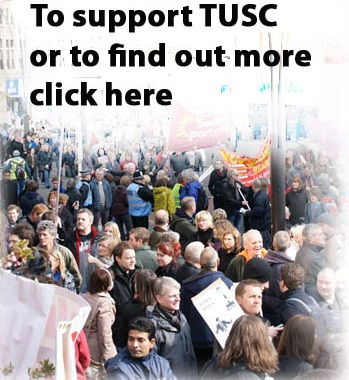 Pete McLaren and Roger Charles, the elected Individual Members' representatives on the TUSC steering committee, said: "Independent socialist members of TUSC are equally excited about what a Jeremy Corbyn-led Labour Party could deliver in terms of socialism and an end to austerity. Jeremy's refusal to play to the politics of fear, xenophobia and Islamophobia during the election was significant. "There is a new political mood in Britain. Hundreds of thousands of young people voted for Labour based on the most radical and socialist policies for a generation. We will work to ensure this is followed up, and that Labour follows Jeremy's lead at local level by opposing cuts to public services and benefits and starts prioritising the needs of the people to make life better for all". Dave Nellist concluded: "Unlike the media 'experts' TUSC knew that the election would be close, arguing when the election announcement was made that with Jeremy's 'core socialist policies he could confound the pundits' predictions and win enthusiastic support' (TUSC press release, 22nd April). "Now there is a chance to show what Jeremy Corbyn's anti-austerity policies could mean in practise if Labour councillors refused to vote for cuts in the council chambers. And TUSC will fight to make that happen".